At New York Comic Con this weekend, Amazon released the first look at its upcoming miniseries, Good Omens, based on the classic fantasy novel. At a press event, co-creator Neil Gaiman and members of the cast explained their approach to adapting the book for television. The comedic fantasy novel was a collaboration between Neil Gaiman and the late Terry Pratchett, in which Aziraphale, an angel played by Michael Sheen, and Crowley, a demon played by David Tennant, must collaborate to stop the coming end times. The two have become unlikely friends in the last 6,000 years, and together they’ve come to like living on Earth, and don’t want to see it end. 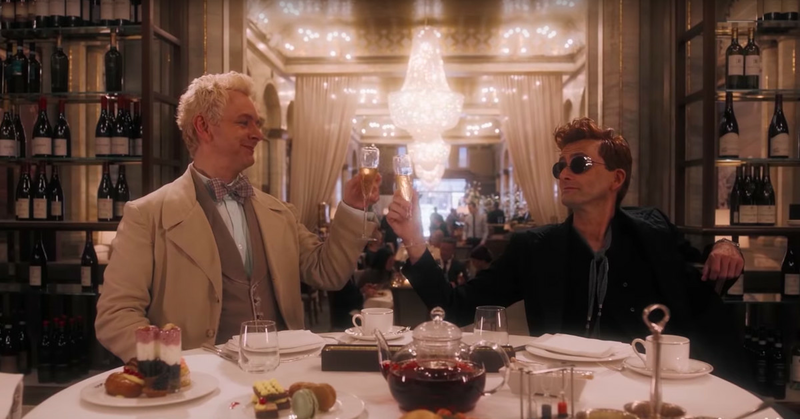 The trailer introduces us to both creatures as Crowley reaches out to Aziraphale to tell him that the world is coming to an end. It goes on to detail their long years of friendship as they meet run into one another over the years; from the looks of it, the series will have a real buddy-comedy feel as the two team up to stave off armageddon. Good Omens will begin streaming on Amazon Prime in 2019.